Thunderstorm alert LIVE UPDATES: IMD predicted thunderstorm with rain and strong winds over NCR including Hisar, Kaithal, Jind, Kurukshetra, Karnal in the next two hours. The parapet of a building collapsed in Badarpur area of south east Delhi on Tuesday night, injuring three children and a woman. A Delhi Fire service official told PTI that the incident took place apparently due to high-speed winds. 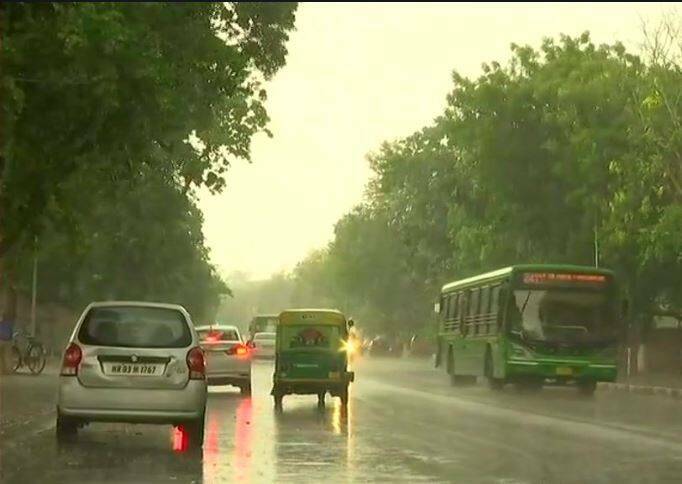 Delhi government had put search and rescue teams on standby in the wake of the weatherman issuing a warning of heavy rain and thunderstorm. The traffic police has alerted their field formations to be ready to remove obstacles such as fallen trees and asked commuters to check weather conditions before travelling. According to IMD, Uttarakhand will continue to experience thunderstorms in the next 24 hours. Heavy rains and thunderstorm are likely to hit the national capital tonight, according to the MeT department. The maximum temperature was recorded at 34.7 degrees Celsius today, four notches below normal while the minimum settled at 22 degrees Celsius, norm l for this time of the year, a MeT official said. The humidity levels oscillated between 54 and 28 per cent. Thunderstorms and lightning on May 2-3 killed at least 134 people and injured more than 400 in five states, including the hardest-hit Uttar Pradesh, the Home Ministry said today. The highest 80 people were killed in Uttar Pradesh and nearly 100 others were injured in the state. A majority of the deaths and injuries were reported from the Agra region, a home ministry spokesperson said, giving the latest figures. 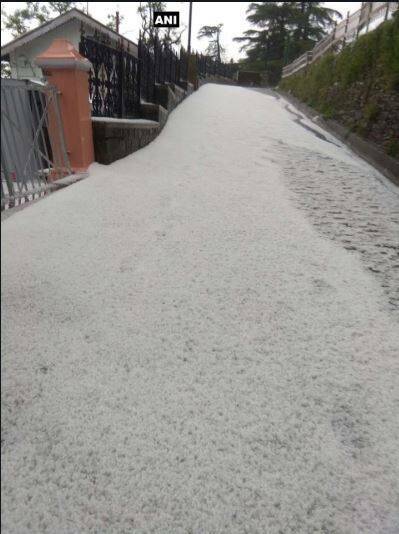 Thunderstorm and hailstorm alert issued for Uttarkashi, Chamoli, Rudraprayag, Pithoragarh districts for the next few hours. The meteorological department has warned that thunderstorm accompanied with squall and wind speed of 50-70 km/hour may hit isolated places in Sikar, Ajmer, Nagaur, Jaipur, Dausa, Alwar and Tonk districts from 9 am–11 am today. The weather office has forecast dust storm, thunderstorm or light rains in 26 out of 33 districts of Rajasthan today. Heavy winds hit Ajmer and some areas of Jaipur this morning while a dust storm hit Bikaner and nearby region last night. Gusty winds swept parts of Rajasthan overnight and this morning, affecting normal life, weather officials said. No casualties have been reported so far. An advisory was issued to avoid travelling to the high hills of Kullu, Sirmaur, Chamba, Lahaul and Spiti and Kinnaur districts as chances of snow and rain are high over the next 24 hours, IANS quoted a government spokesperson as saying on Tuesday morning. Kullu Deputy Commissioner Yunus Khan told IANS that tourists and locals bound for the Rohtang Pass, some 52 km from Manali, were not allowed to go beyond Marhi, due to continuous snowfall that has resulted in snapping of road links leading to the pass. 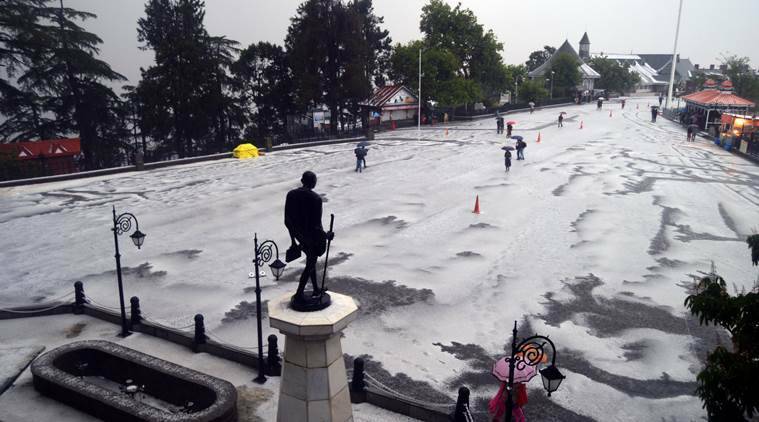 Meanwhile, the Himachal Pradesh government on Tuesday advised locals and tourists not to travel towards the higher reaches as moderate snowfall and rains continued across the state. Monday's maximum temperature in Delhi was recorded at 39.6 degrees, while the minimum temperature settled at 24 degrees. "The day ahead will be cloudy. Rain and thunderstorm accompanied with squall is likely to occur later in the day," an India Meteorological Department (IMD) official said. The minimum temperature was recorded at 25.8 degrees Celsius and the maximum temperature was likely to hover around 41 degrees Celsius. The humidity at 8.30 a.m. was 58 per cent. The national capital woke up to a cloudy morning on Tuesday with predictions of rain and thunderstorm, a Met official said. 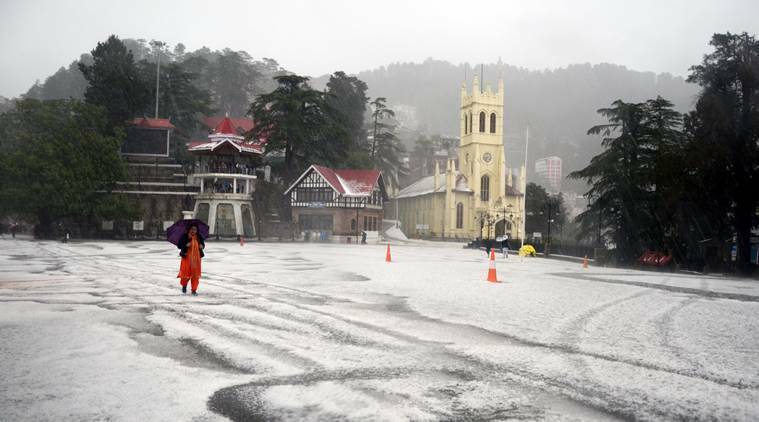 The weather office also warned that thunderstorms, squalls and gusty winds are likely to hit many parts of India, including Delhi, till Friday even as the mountains of Himachal Pradesh received fresh snowfall. All the public and private schools in Ghaziabad will remain closed on Tuesday in view of the adverse weather expected, it was announced on Monday. In an order, District Magistrate Ritu Maheswari said that in view of the forecast for a thunderstorm on Tuesday, private and government schools and colleges shall remain closed. 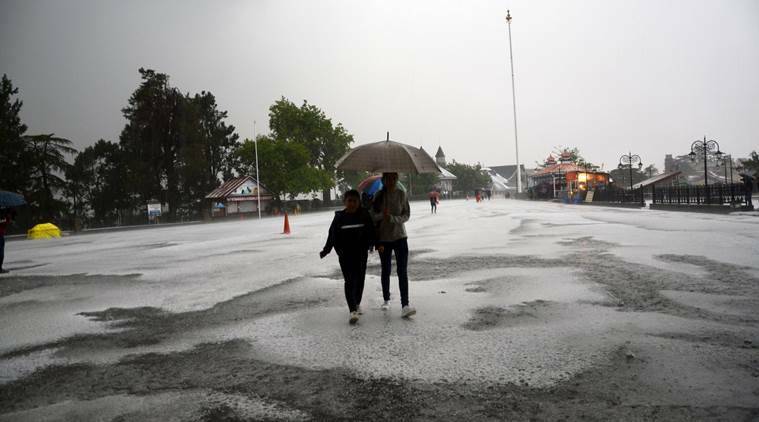 Strong surface winds followed by hail storm turned the weather in Uttar Pradesh's Agra on Monday prompting an alert from the Met office for the next 48 hours till Wednesday. District Magistrate Gaurav Dayal issued a detailed advisory with "Dos and Don'ts", gearing up for another deadly storm as the Met warned of high-velocity winds and heavy showers in the region. "Chances of severe Dust storm over Delhi and NCR have decreased. We expect one or two spells during afternoon and evening. Winds will be 50 to 60 Kmph gusting to 70 Kmph," said Mahesh Palawat, Vice President, Weather and Climate Change, Skymet Weather. 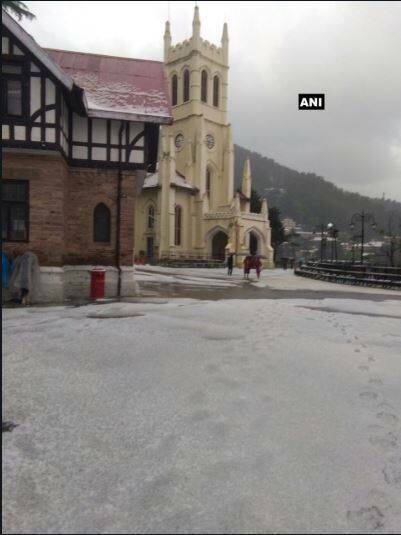 Meanwhile, Badrinath received fresh snowfall this morning, 2 inches of snow covers the area. Hemkund received fresh snowfall too. Badrinath Yatra underway. 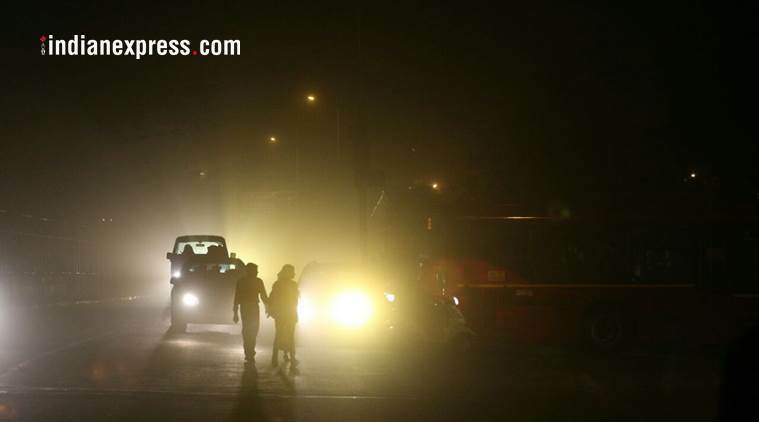 The commuters have been advised to take shelter under concrete structures. Drivers have been advised to use dippers or parking lights while driving. The advisory says that commuters should “keep themselves updated about weather conditions and plan their journey accordingly”. The revenue department of the Delhi government has issued directions to all district officers and said water and power utilities would also keep restoration teams ready. Delhi traffic police has asked commuters to check weather conditions before travelling. A dust storm is a strong, turbulent wind that carries clouds of fine dust, soil, and sand over a large stretch, which mainly occurs in arid and semi-arid regions. In case of a dust storm, due to excessive heating, the water from the clouds evaporates before it could land. So soil is dry and the severe winds lift this soil up to 500 metres above the land. While wind speed is normally around 50 kmph in a thunderstorm, in case of dust storm, it reaches up to 100 kmph and in some cases it can touch 130 kmph, making conditions severe. Kamal Kishore said the NDMA had prepared videos on precautions to be taken during lightning. These videos were in English and Hindi and could be translated into local languages. There are some other videos too! National Disaster Management Authority (NDMA) member Kamal Kishore said there is a need to “vigorously” push for creating awareness among people. “The NDMA provides normative guidance than needs to be then adapted to the local context,” he said. Days after dust storms whipped through parts of Rajasthan and Uttar Pradesh, killing over a hundred people, a blame game has started between the Centre and the India Meteorological Department (IMD) over alleged lapses in the weather warning agency’s early warning mechanism. While the Centre has asked IMD to explain why its forecasting mechanisms failed to prevent the deaths, the meteorological agency maintained it had called up chief secretaries of the two BJP-ruled states, but they had “failed to disseminate the information.” The IMD also said that its role was to forecast and issue alerts, while it was up to the state authorities to take it to the “last mile” and alert people.